Accomplished housekeepers, shield your eyes! I handed my husband a bottle of after-shower spray and said "Have at it." Today, I was brave enough to throw back those shower doors. Hadn't I just vowed to make my family feel like guests? Forget the fancy drinks--a clean bathroom is a luxury my uncomplaining husband can well afford. While vinegar penetrates the soap scum, I surveyed the towel situation. A year of potty training has left them less than...pristine. "January white ssssss-sales," my inner bargain-hunter whispers. I make do by soaking the lot of them in hot water and borax for brightness. I prefer hotel-style tub mats. Thin mats dry quickly, and with no rubber backing to disintegrate, last forever. Looking for more bathroom ideas? It's been a while since my staged-for-resale bathroom looked this good! Even grocery store Dial soap can look pretty. Following in the bathroom theme we've needed to replace the shower rod. I've coveted those curved ones since a hotel visit years ago but would not spend the money. Last week Aldi's had them on sale for $20 and I snagged one. Everyone is impressed with how much more roomy it seems inside. Also, I took advantage of the closing of Linens-n-Things and purchased large bath towels. I refused to pay $6.00 for a bath towel and $5 for a washcloth and so we took the older towels and got six washcloths out of each one. Not beautiful...but very practical. I cannot for the life of me keep my white towels white, despite hot water washings and bleach! How does everyone else do it? I don't see what potty training has to do with it, though. Surely you don't use towels for THAT? My towels just look dull way too soon. I love white towels and have no problem keeping them white. I wash our towels after one use (sometimes two) and use Clorox every time. I know some of you probably don't like using a lot of bleach, but it sure keeps the towels looking nice and I feel like they are really clean - especially the kitchen towels. I bleach occasionally but the real danger is that continued bleaching breaks down the fibers and creates holes. My kids have the unfortunate method of wiping where they shouldn't during messy attempts at the potty. I think I have written about this before! 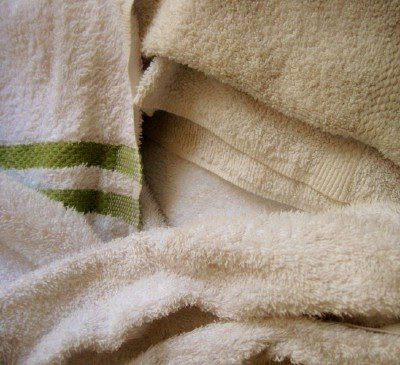 If you soak the towels overnight--not just wash them--you'll have a much better result than washing alone. Kay--smart on the washcloth make-do! I have never understood how washcloths can almost the price of a towel. I found a pair of these hotel type tub mats at Goodwill. However I have seen the Ralph Lauren tub mats on sale at Neiman Marcus.com for only $12 with FREE monogramming! Yes, more info please ... I really need help to make mine sparkle! Thanks! We got white towels for wedding presents and 10 years later, they are still fine. I have a black and white bathroom, too, so it would show if they were too grimy! I bleach occasionally, always hang to dry in the sunshine, and always soak overnight in hot water. 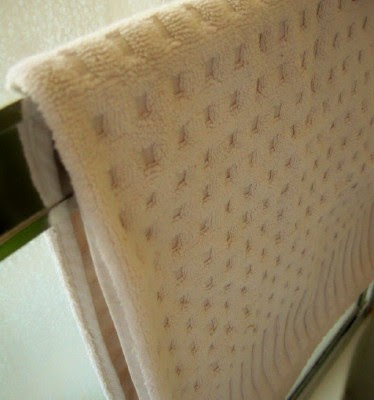 I do NOT use white handtowels - my hand towels wear out much faster than bath towels. I use grey to complement our bathroom colors. The kids use their own towels which are colored. I love the bath mat! I'll have to look for one like that the next time I'm in the market for one. 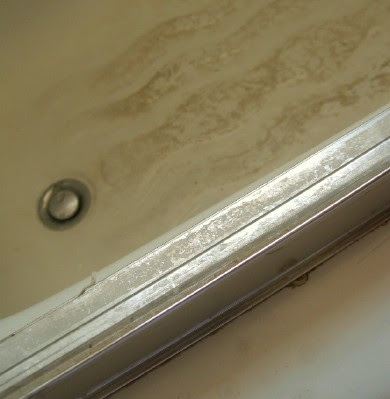 The sight of your shower door tracks made me cringe, and not because of their appearance!! No, I cringed because I used to have to clean the one like that at my parents' house and I hated it! I am so thankful we just have a shower curtain that can be tossed into the washer. Thanks for motivating me! My bathroom is in sore need of a cleaning, and I feel bad sometimes that I don't do better for my husband who always cleans up after himself so well. I was really motivated by your soap article--I want to get a big glass jar now and keep our soap in it. I recently got a big batch of bath towels at a Mervyn's closeout sale. We should have enough to last for years. I have only had one white towel go grey, and that was after a throw-up incident where I washed it with something that I knew would bleed. I use hot water and homemade detergent, and sometimes bleach. That plunger in the corner of the bathroom, always at the ready? Borax works beautifully as a scrubbing compound when trying to do away with an unsightly ring around the tub... but know of us has that, right?! I know I can do better, too. Thanks for inspiring me to get to it today. It's nice to know I'm not alone! I finally cleaned our bathroom top to bottom after much avoidance and I've SWORN never to let it get that bad again. Ha ha. A lovely plan to "love" on your family. Anyway, thanks for another inspiring message. Really enjoyed this! I read an article in Family Fun today about having a little winter vacation at home. I can imagine you doing a marvelous one, with the bathroom set up with clean white towels, a bath robe and little samples and candles...moving on to a picnic in the living room and a weekend of fun events outlined for the home and nearby. It sounds like that is what your whole life is going to aim to be like these days. :) What a blessing! So clean and nice! I have recently found a good way to clean the shower. The spray cleaners were really bothering my lungs so I somehow got the idea to rub a wet Dobie pad with a bar of Fels Naptha. You can just feel the scum and junk coming loose. Then just rinse it down with the shower sprayer. Thanks for the motivation. I got so sick of cleaning my shower doors and tracks! They were in horrible shape so my husband just took them off and now I just use a shower curtain. Soooooooo much easier to take care of and I can change the look of our bathroom for just a couple dollars with a new shower curtain! As for towels... I use tan. Pretty but do not show the stains as badly. I do soak my towels, use only one time before washing, use bleach, hot water, and still they are not pristine white like I would love them to be. Perhaps it is because we have well water with a lot of lime in it. I would love to keep them snow white! remember a looooong ago post about boiling dirty kitchen towels? It has nothing to do with this post, but just remembered because I tried it, back then. The result was extremely clean kitchen towels and very grungy wash water. I'm with everyone else...love fluffy white towels but they look crummy after a short while. I've thought about just buying cheaper ones and getting new ones every now and then but I hate towels that seem to smear the water as opposed to soakiing it up...wow, I'm going on and on about towels, who knew I felt so strongly!!! I've never tried the Hotel brand but I may just take the leap! My tub looks awful right now. When we moved in to the rental, we found that there was mildex. I have yet to get into the tub and scrap, bleach and re caulk, but its a job that MUST be done before baby no. 3 arrives in the Fall. I want my bathrooms clean! I can't even take a bath because I am so grossed out! BTW, any suggestions for the old fashioned small tile floor. Like I said, we moved in and the bathrooms smelled like people had pee'd on the wallpaper. I am taking the wallpaper off, but I still have a 4 yr old boy that doesn't aim great. The floor looks like it hasn't had a good scrubbing in years. When we moved in I got a scrub brush and some hot soapy water and went to town, but once I would clean the grout and I would wipe it off, the nasty stuff would go back in the grout. Argh! It was like a losing battle! Do you mind telling me where you can find hotel style tub mats at? I learned never ever get a mat with backing. It ruined all three bathrooms linoleum to a yucky yellow color and it can not be removed. I am going to try a new recipe for greener cleaning basic peroxide in a spray bottle with some water, and EO's. And also get some bon ami cleanser. I'm one of those frustrated by not-white white towels but I've come to think it has a lot to do with the water one launders in. "Hard" or mineralized water = maybe grungy towels despite bleach, borax, etc. So any future purchases for me will be taupe or beige. Did vinegar work on the tub and on the shower doors as well? Did you dilute it or spray it on full strength, or just rub it on with a sponge or cloth? I always hear how good vinegar works for cleaning, but must confess that I still buy commerical products. We're visiting family in Florida right now - a great winter getaway! And we've been spoiled by the super clean bathrooms and kitchen untouched by toddlers' hands. I can't wait to get home to get mine in shipshape again. Thanks for the inspiration. I love what Borax can do to whiten things -- and for such a reasonable cost per box, too. Our tub looked similar after my pregnancy (my little guy was born a couple weeks after yours) - I also could not contort like that, so hubby took over the bath duties! :) To get rid of the grime, I found that dipping a dampened cloth into baking soda and rubbing it directly onto the yucky spots did wonders. It's mildly abrasive, but safe to even put kiddies in the tub after using it. I too have a front loader. I add just a 1/4 cup of bleach to my whites. I add Borax (1/4 cup)too. My machine has a dispensor for bleach, softner, and soap. I put the Borax into the first cup. (this is what the machine uses in the soak cycle) Liquid HE soap into the dispensor and bleach and softner into their cups. I have a really long cycle on my machine. It soaks for an hour and washes in very hot water. 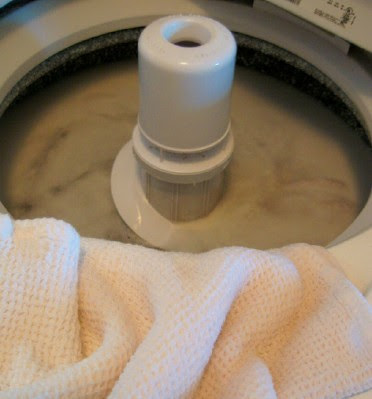 (my machine even heats the water) I have hard water and by using Borax, a 1/4 bleach, and a good soap, (I use Tide) my white towels and sheets and underware are very clean and bright. I also hang my laundry out on a line. In the sun. I live in Texas and we can do that all year without a problem. how'd you know my bathrooms were on my list to clean today? funny thing about the "men" in my house - they really don't notice the scum! but i do (sigh...) great post! Thank you for the inspiration. My husband is away for the week and I'd love to surprise him with a cleaner house. I just tackled my bathroom shower door with a Mr. Clean eraser and some dishwasher detergent. Not as frugal as vinegar, but very frugal of my time since the soap scum came off in minutes without scrubbing. As for towels, I've long since given up ans since switched to darker "sand" or "tan" colored towels. Elegant (think subdued spa instead of hotel), almost as easy to coordinate with different brands as white, and much easier to maintain with a husband and toddler. My favorite way to scrub the tub used to be soft scrub and a scrub brush...but have found recently I can get great results (using less elbow grease) with either shaving cream or shampoo. Just wipe it on, leave sit for a bit, then scrub off. You may have something that works for you already, just wanted to share that. I've really enjoyed visiting and catching up on your posts. Do you still do Bento-style lunches? Ivy from Home Ec 101 used to be a professional cleaner, and she told me abuot the vinegar. It works--but only on soap scum. Not good for mildew. I pour it on and give it a few minutes to loosen, then it literally wipes away. There is little/no ventilation in this shower area so I hate to use a Tilex or other bad-smelling chemical there. What other natural remedy cleaners do you use? I am moving away from the harsh chemical cleaners and looking for ideas. I have a relatively new (3 years old) shower that is frequently used and it already has mildew in the grout. YUCK! The shower is cleaned weekly by my cleaning woman, but still has mildew in areas where the water hits. Areas above that are pristine white. I have tried Tilex (horrible smell) and Softscrub, but they have not helped. Any ideas would be greatly appreciated. Kim happened to mention that you have a recipe for homemade liquid dish soap. I poked around a bit but didn't find it. Is it, perhaps, not posted? If it is posted, would you email me the link please? Thanks. Clever, make-do lady! 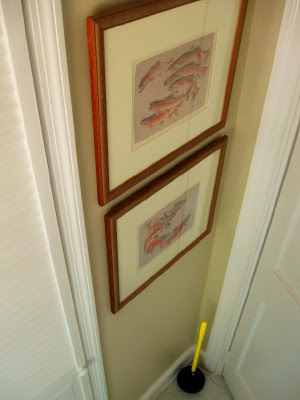 Thanks for the photo-essay of reclaiming your bathroom for your family...and yourself. Love this post! I am going to be on the hunt for hotel bath mats...the rubber backing on mine is getting old and yucky! I am a known hyper-organizer and I am in *love* with this closet!! Yet after 4 (almost 5) small children, I can feel overwhelemed by trying to "keep up" with my organization and cleaning standards. Today, you have helped this tired/sick momma feel just a bit motivated! I am going to go through my hall closet and see what I can do. Some new (to us) white towels would be great! Plus I adore the idea of putting everything in bins (or baskets) to clean up the inevitable clutter. One last thing, everything I've read has said 1/2-1 c. bleach per gallon of water solution to clean up mildew. I have used Clorox's Bleach cleaner - but I'm guessing this simple bleach/water solution would be much cheaper.